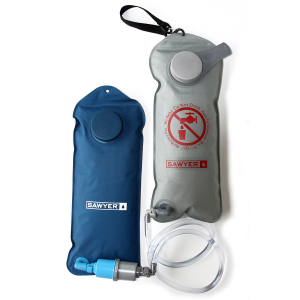 I do not use the Sawyer 4 Liter System...I use the Sawyer .02 filter in combination with a Platypus Big Zip to create an easy to use high capacity gravity filter. 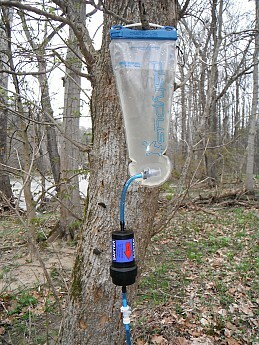 To operate it you simply dip the Platy bag into a river or lake...hang it from a nearby tree with the filter attached...and a few minutes later you have 2 liters of safe drinking water. The system is overkill and too large for backpacking...but it works great for remote base-camping. I use it mostly for group paddling trips...where near plenty of water it has given me trouble-free service for years with nearly the convenience of my sink at home. Sawyer and others make lighter and faster filters...but the Point Zero Two is the only one I know of that filters out viruses as well as bacteria. 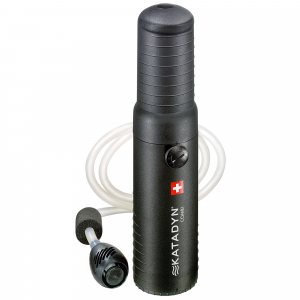 Viruses are not that big of a concern here in the US...and a few viruses like Polio are smaller than .02 microns...but by and large the Sawyer Point Zero Two filter provides liters and liters of worry-free water that is a level safer than most filters. I cannot say with a lot of specificity how much water you can practically filter with the system...but groups of seven or more use it regularly on remote paddling trips...and there has never been an issue with keeping up with demand. In the field I rarely push the filter's capacity...but on a few occasions I have filtered as much as 8 liters an hour. I always do other things while the filter works...so if I paid closer attention I am sure I could increase that amount a few liters. In short...this thing makes a lot of water for very little effort. 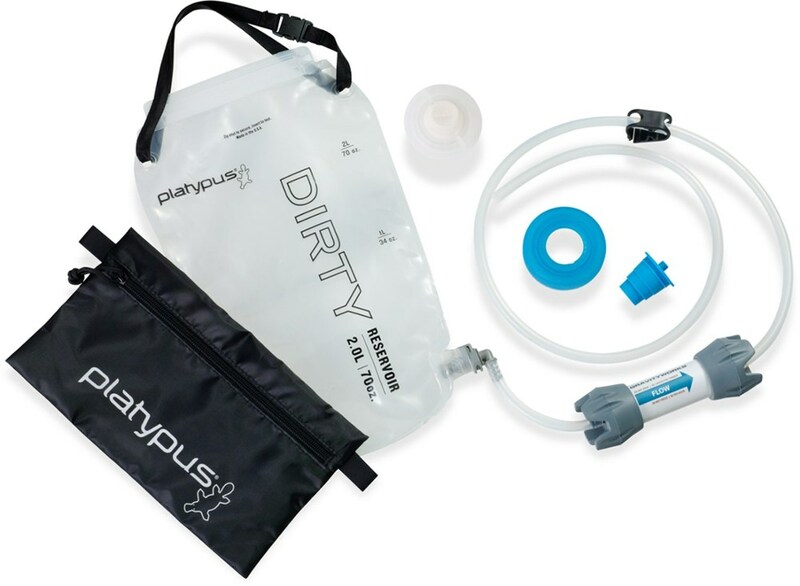 The care for the filter is about as easy as it gets if you have another Platy bag to reverse the filtration process...otherwise Sawyer provides a syringe to clean the filter. By reversing the process every few uses I have never had to use the syringe...but the water I filter tends to be on the clearer side. If you expect to filter water with a bit more stuff it might be prudent to bring the syringe along, though I doubt you will need it. At home I clean the filter by running clean water with a little bleach through the system and letting it all air-dry for a day. Freezing temperatures can damage the filter, so I store everything indoors and avoid using it in the field when I expect temperatures to drop below freezing. 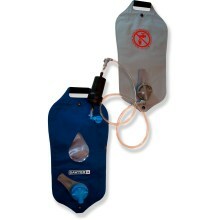 Gravity filtration is a great way to go for backcountry camping with a group of a least two. 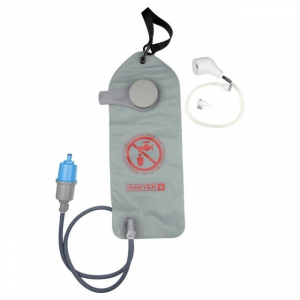 A pump can be more convenient for single person, or for during a hike. Scooping water into the dirty bag is not easy. I am never able to fill beyond ~ 2/3rds full. Cleaning system (using sink adapter) is a kludge (e.g. uses zip ties to connect the parts) and cannot withstand reverse pressure. Syringe system may work better, but doesn't come with this kit. welcome to Trailspace, CQ. Filling the unfiltered bag seems to be a problem with all of Sawyers products. Check out Joseph's review. He bought a Platypus and added the filter. I've recently done the same. 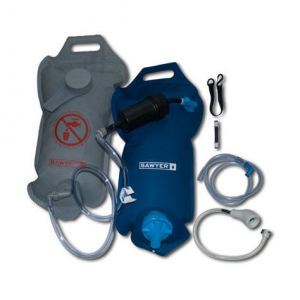 The Sawyer Complete 4 Liter Gravity Water Purification System is not available from the stores we monitor. It was last seen September 26, 2017	at EMS.